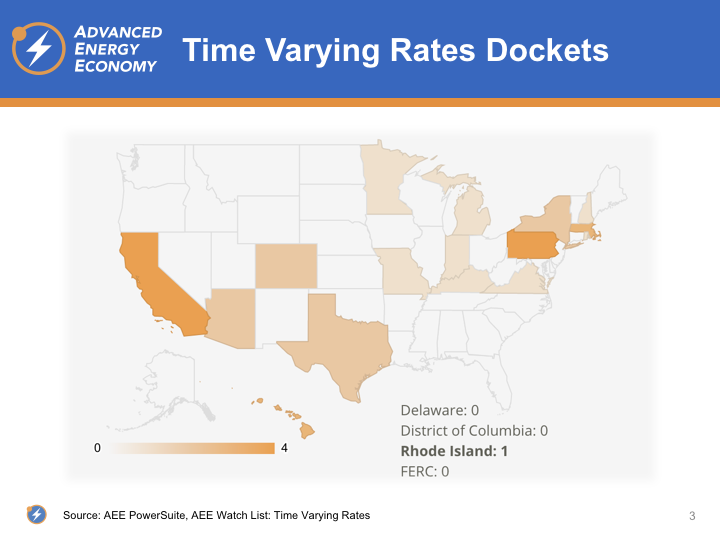 The State of Advanced Metering Infrastructure and Time-Varying Rates, in Three Maps and One Graph. The Leaders – and Laggards – May Surprise You. Two weeks ago, the U.S. Energy Information Administration (EIA) released its final 2016 data files (EIA-861), detailing valuable information such as sales, revenues, and utility data for the electricity industry. At AEE, we’ve been digging in. 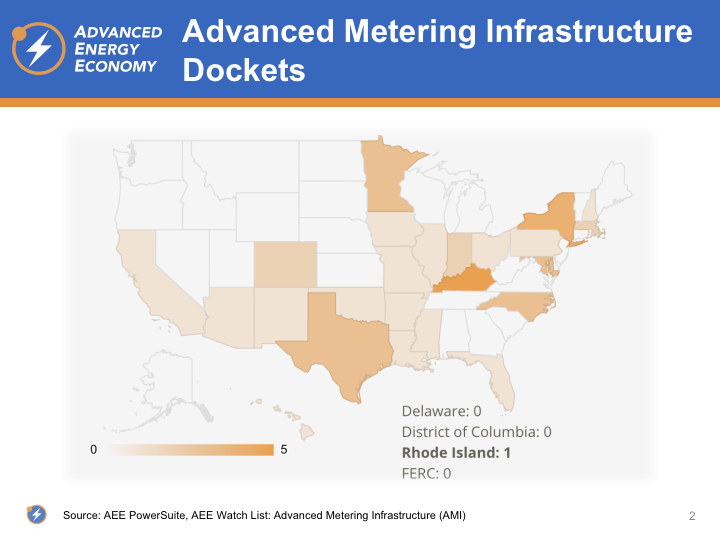 Two of the key trends we have been tracking this year, and that we analyzed first, are advanced metering infrastructure (AMI) and time varying rates (TVR), by state. Which are the leaders in smart meters and smart rates? Not who you think. AMI, or smart meters, are a foundational and invaluable technology needed to enable a smarter, flexible, clean, and affordable grid. Specifically, AMI connects a home to the electric grid through a two-way communication system capable of recording and transmitting data between the end user and the utility. As of 2016, there were over 70 million AMI meters installed in the U.S. – a 9.4% increase over 2015, and about 47% of meters overall. The biggest increases in residential smart meters installed were in Illinois (+43%), Alaska (+21%), Kansas and Michigan (+24%), and Oklahoma and Tennessee (+22%). Probably more surprising are the states that are falling behind. 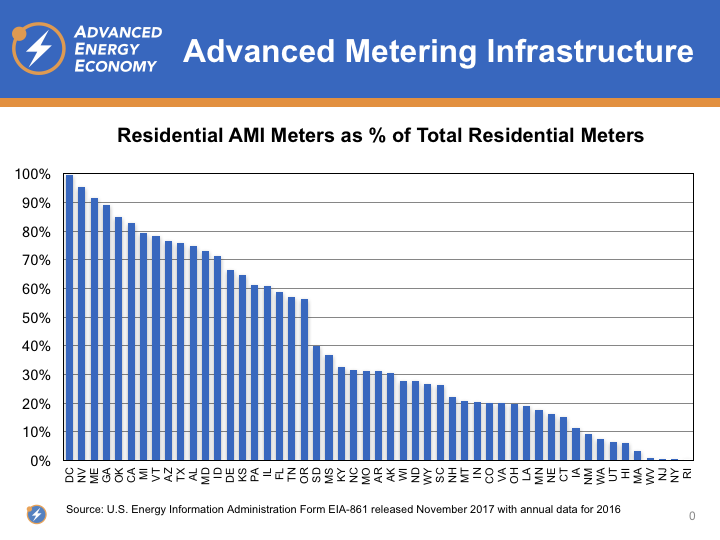 Many of the laggards in AMI deployment are seen as leading the country in electricity system reforms, including New York, Rhode Island, Hawaii, and Massachusetts, as well as a fifth, New Jersey, which has one of the highest shares of net metering customers in the country. However, several of these states should soon find themselves moving up the list, as at least three are in the midst of large grid modernization initiatives – New York, Rhode Island, Hawaii – and should soon be deploying AMI at a quicker pace. Where there is smart meter deployment there is regulatory action, so we are currently keeping tabs on key AMI dockets through PowerSuite, AEE’s digital platform. Most recently, on August 29, Hawaiian Electric Co. filed a $205 million grid modernization plan that includes targeted smart meter deployment. In Colorado, the Public Utilities Commission approved a settlement agreement on July 25 that, among other things, initiates full AMI roll-out in Xcel Energy’s service territory commencing in 2020. And Entergy has been busy seeking approval for AMI roll-outs in several jurisdictions in 2017, including recent affirmative decisions in Louisiana, Mississippi, Arkansas, and a pending application in Texas. One of the capabilities that smart meters unlock is time-varying rates (TVR). TVRs can take many forms but they generally work by pricing electricity higher at times when demand is high, encouraging customers to reduce their use when electricity is the most expensive to generate or when there are capacity constraints on the system. In 2016, the leading states in TVR adoption remain largely unchanged from the previous year. There are now 7.95 million customers enrolled on TVRs, a 4.7% increase over 2015. Maryland continues to lead the nation, with over 75% of their residential customers on time-differentiated rates. This is largely the result of Baltimore Gas & Electric’s (BGE) highly successful peak time rebate (PTR) program, Smart Energy Rewards. As of 2016, BGE had enrolled over 1 million customers on its PTR, which is the default rate for customers with a smart meter installed on their property. The program notifies customers by phone, email, or text the day before an “energy savings day”; if customers reduce their usage from 1pm to 7pm, they receive a $1.25 per kWh bill credit. Other states leading the pack in terms of residential customers on a TVR include Delaware (59%), Oklahoma (37%), Arizona (32%), and Ohio (15%). However, we expect to see several new states crack the top of the rankings in the coming years. 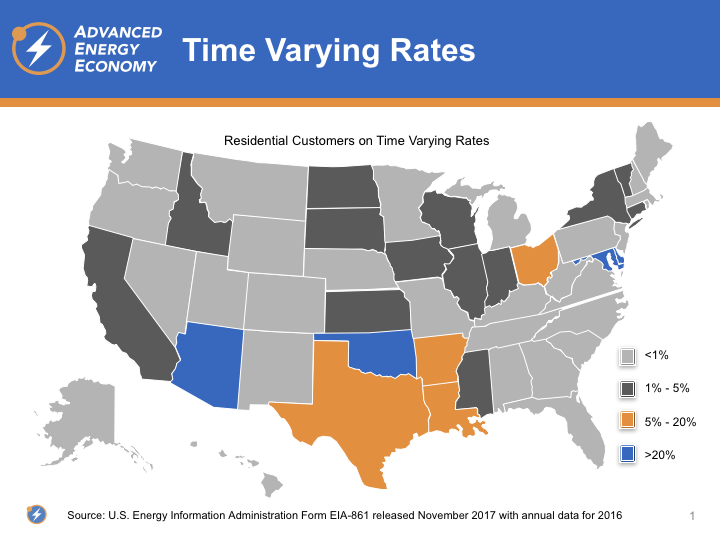 Most notable is California, which is expected to move toward default time-of-use rates for residential customers in 2019. Greater use of TVR could also emerge from several alternative rate design investigations across the country, including in Minnesota, Rhode Island, Pennsylvania, and Missouri. Data don’t lie, and we will keep looking at the data from EIA to highlight key advanced energy trends. To keep up to date on energy policy developments across the country yourself, check out AEE’s PowerSuite.